On March 26, 2014, three (3) hearing examiners for the state of Maine Public Utilities Commission (PUC) released a report (and Appendix) concluding that the “installation and operation of … smart meters and related devices and systems are consistent with [the utility’s] statutory obligation to furnish … safe, reasonable, and adequate service.” The report was issued in the form a draft Commission order. Affected parties had until April 11 to file comments or exceptions to the report. Based upon the above Law Court ruling, the Maine PUC is obligated to resolve whether or not smart meter technology is a credible threat to the health and safety of utility customers. As yet, and based upon a review of the PUC Examiners’ report, the health and safety issues have not been resolved. Why not? 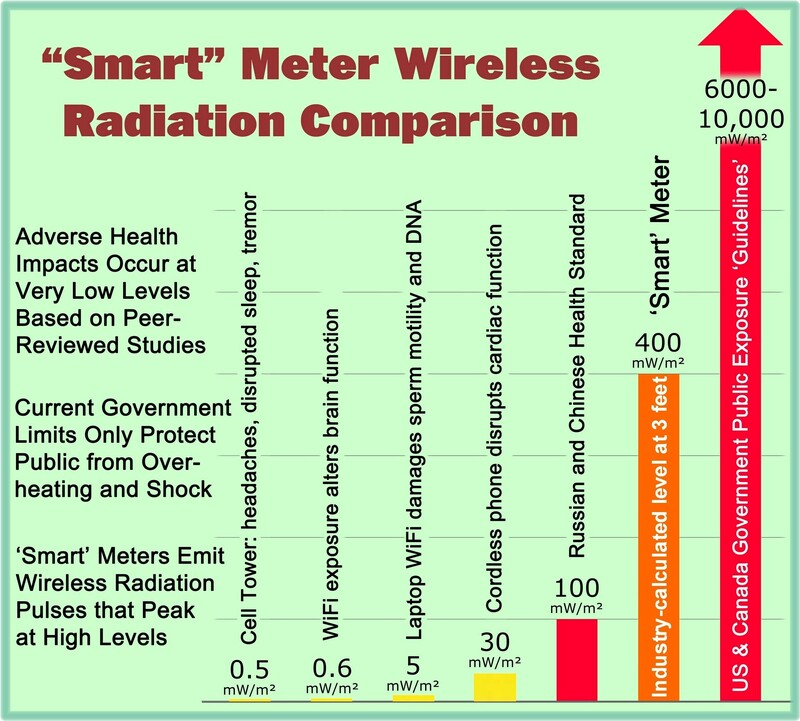 The wireless and smart grid industries invested in promoting smart meters and other wireless devices rigidly adhere to a thermal paradigm where RF radiation induced biological effects can only be caused through thermal mechanisms such as shock and burn. To consider any changes to the current thermally based RF exposure guidelines or to take any actions to protect the public, the industry demands “conclusive evidence” or “proof” of any health effects due to chronic or low level RF exposures. Realizing the potentially catastrophic results to the population and the environment of waiting for “conclusive evidence,” of adverse health effects, many concerned members of the public, independent scientists, and health professionals advocate a precautionary approach where limited evidence of harm would result in prudent measures being taken to protect the public. 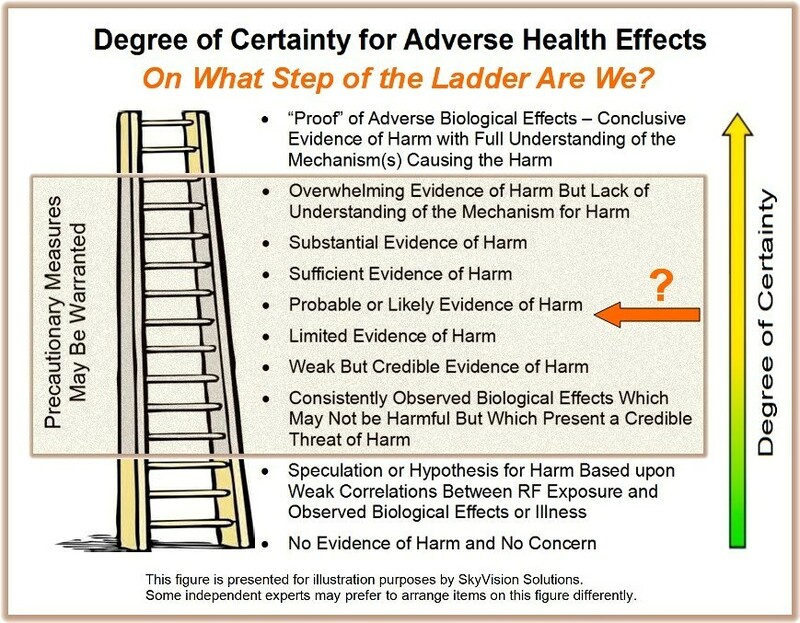 In an attempt to better illustrate the above situation, refer to the figure below showing a “ladder” with various degrees of possible certainty for demonstrated adverse health effects from RF exposure. Those individuals from the thermal paradigm group are stuck at the bottom of the ladder stating that talk of low-level health effects from RF emissions is nothing more than “speculation.” These same people further state that in order to take any action to protect the public you must find a way to jump to the top of the ladder showing absolute proof of harm including the mechanism causing the harm. Those individuals advocating caution acknowledge that limited levels of evidence exist demonstrating that adverse health effects are caused by RF emissions or at least acknowledge a credible threat for harm. Some scientists and independent experts believe we are further up the ladder than others. Between speculation and hypothesis toward the bottom of the ladder and absolute proof at the top of the ladder is a range where precautionary measures may be warranted based upon an objective review of the available scientific evidence and its possible negative impact on society if nothing is done to avoid harm. Supporters of the smart meters and wireless industry typically ignore this range of possible levels of evidence and actions, pretending that it doesn’t exist. In Maine we appear to have a situation where the Law Court appropriately expects the PUC to resolve whether a credible threat of harm does not exist in order to demonstrate that smart meters are safe. But so far, the Maine PUC has bungled this analysis in at least two separate ways. First, the Maine PUC in its examiners’ report has not evaluated the safety issue in isolation but rather combined and conflated it with the separate issues of what is reasonable and what is adequate. Second, the PUC has yet to resolve whether a credible threat of harm exists but rather focuses predominantly on whether the Complainants have proven adverse effects (at the top of the ladder). On what step or rung are we located on the “ladder of certainty” figure as used above for illustration purposes? From this Author’s perspective, current evidence for RF exposure effects puts us somewhere about half way up the ladder with reason to suspect that mounting evidence will lead us still higher. It seems absolutely clear that we are beyond speculation and hypothesis and based upon the evidence of record for the Maine proceedings, it is apparent that smart meters pose at least a credible threat to the health and safety of utility customers. Certainly, the Maine PUC has not yet “resolved” the issue. First of all, there are many independent scientists who do have hypotheses for a damage mechanism for RF induced effects, but in any case, the logic and criteria used by wireless industry supporters go well beyond the “Bradford Hill criteria” that are widely accepted as a logical structure for investigating and defining causality in epidemiological study. Professor Sir Austin Bradford Hill developed a list of nine factors for determining when there is sufficient evidence to infer or deduce, but not necessarily prove to a scientific certainty, a causal association between an agent and an adverse health condition. “Before deducing ‘causation’ and taking action we shall not invariably have to sit around awaiting the results” of decisive research. He refers to nine “aspects of that association” to be especially considered “before deciding that the most likely interpretation of it is causation.” Specifically, a mechanism between cause and effect is helpful, but Hill noted that knowledge of the mechanism is limited by the current level of scientific knowledge. In short, as a matter of implementing appropriate public policy, we should make decisions and take action based upon what we do know rather than what we don’t. Do the above excerpts sound familiar in comparison to what has been happening regarding literature produced on possible adverse health effects from RF radiation exposure? Thus, there may be reason to exercise caution (and a precautionary approach) not only based upon the available science showing adverse health effects but also because of the ongoing efforts from companies like Exponent to pollute the science we have. It is clear that the Maine PUC examiners’ report is basic industry propaganda where the “examiners” performing the review had a predetermined vision of what they wanted to write in the end. The report represents a deeply flawed and biased analysis of the health and safety issues for smart meters. It is vitally important that people everywhere take steps necessary to have individuals appointed to public utility commissions that look after the interests of the people and not simply parrot utility industry propaganda. In addition, the people must hold utility company executives and public officials accountable (and liable as individuals, if need be) for their actions in violation of the public interest and individual rights, in this instance with regard to the forced deployment of ‘smart’ meters and the fees that may be charged for those people who do not consent to ‘smart’ meter installations. This entry was posted in Smart Grid, Smart Meters, and RF Emissions and tagged Health Effects, Maine, RF Emissions, Smart Meters. Bookmark the permalink.